A surprising fact to most, “Jaywalking” is not an actual legal term, there are no “Jaywalking” laws in the state of Florida, and the word is not even located in any of the Florida statutes. The earliest known usage of the term “jaywalker” was in the Chicago Tribune in 1909. “Jaywalking” is a derogatory slang word that was coined, in part, by local auto clubs and dealers, which was an attempt to redefine streets as places where pedestrians do not belong. Automotive interests used these propaganda campaigns to put the blame on pedestrians who walked in the streets and crossed them whenever and wherever they wished, which was the same way they had done for centuries before the automobile became popular. 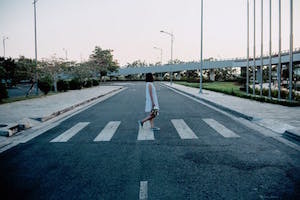 In the present day, people refer to various actions as “jaywalking.” Some are, in fact, illegal, such as crossing a street against a red light. But other actions, like crossing mid-block (which is also referred to as “jaywalking”), are not illegal in most areas. To understand “jaywalking,” we must first understand the concept of sidewalks and crosswalks. Another surprising fact for most is that every street has a sidewalk under the law. The legal definition of a sidewalk is “that portion of a street between the curb line, or the lateral line, of a roadway and the adjacent property lines, intended for use by pedestrians.” So if there is not a paved cement sidewalk next to the road, that strip of grass on the side is actually a sidewalk under the law. A crosswalk is defined as “the continuation of the parallel lines of the sidewalk across the roadway.” So, since every road has sidewalks, every intersection has crosswalks. Therefore, at a cross street, drivers must yield the right of way to any pedestrian in an unmarked crosswalk at that intersection, which is exactly the way how a driver should yield if there were painted lines over the surface. According to the law, pedestrians may not cross “between adjacent intersections at which traffic control signals are in operation.” So, if you are between two intersections and both have traffic signals, then you may not cross. But if one of those intersections does not have a traffic signal, like the vast majority of intersections in the state of Florida, then pedestrians are allowed to cross, as long as you yield to approaching vehicles. Though, while we can talk about the law and all of the protections the law allows, at the end of the day, it may not protect you. When a pedestrian faces down a two-ton chassis of rolling metal, there is only one way that story can end. Pedestrians have rights, but those rights may not stop a reckless driver from endangering those around him. If you or a loved one has been injured due to someone else’s negligence, call us at the Coye Law Firm.